The protection provided by the PXI-2566 can be impaired if it is used in a manner not described in this document. This module is rated for Measurement Category I and intended to carry signal voltages no greater than 150 V. This module can withstand up to 800 V impulse voltage. Do not use this module for connection to signals or for measurements within Categories II, III, or IV. Do not connect to MAINS supply circuits (for example, wall outlets) of 115 or 230 V AC. When hazardous voltages (>42.4 Vpk/60 V DC) are present on any relay terminal, safety low-voltage (≤42.4 Vpk/60 V DC) cannot be connected to any other relay terminal. The switching power is limited by the maximum switching current and the maximum voltage, and must not exceed 60 W, 62.5 VA. Example 1: Five channels carry 4 A while ten channels carry 2 A. 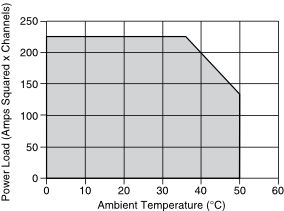 Example 1 can be used at ambient temperatures between 0 °C and 50 °C. Example 2: Six channels carry 5 A while ten channels carry 2 A. Example 2 can be used at ambient temperatures between 0 °C and 41 °C. 1 Switching inductive loads (for example, motors and solenoids) can produce high-voltage transients in excess of the rated voltage of the module. Without additional protection, these transients can interfere with module operation and impact relay life. For more information about transient suppression, visit ni.com/info and enter the Info Code induct. 3 DC path resistance typically remains low for the life of the relay. At the end of relay life, the path resistance rapidly rises above 1 Ω. Load ratings apply to relays used within the specification before the end of relay life. 4 Specifications including the TB-2666 accessory are characterized from screw terminal to screw terminal for the applicable path or paths. 5 Certain applications may require additional time for proper settling. Refer to the NI Switches Help for information about including additional settling time. 6 The relays used in the PXI-2566 are field replaceable. Refer to the NI Switches Help document for information about replacing a failed relay. 7 The PXI-2566 can recognize trigger pulse widths less than 150 ns if you disable digital filtering. Refer to the NI Switches Help for information about disabling digital filtering.